“We are doing more research with such innovative companies in the private sector and this example combines our knowledge of plant science and specialised infrastructure to work with others whose vision is aligned to help solve the challenges around long-term food security. The James Hutton Institute and vertical farming entrepreneurs Intelligent Growth Solutions (IGS) have agreed on plans to establish a futuristic farming facility at the Institute’s site in Invergowrie near Dundee. It is predicted that the collaboration will provide a better understanding of the future potential of vertical farming, and give real insight into the efficiencies, cost savings and range of crops that can be grown. 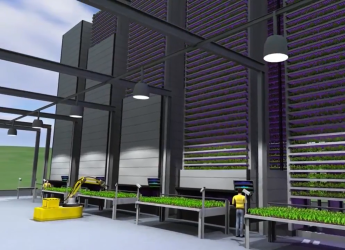 The purpose-built facility, costing £2.5m will be the first in the UK to house automated growth towers for vertical, indoor farming. Perth and Kinross councillors have already granted approval for the project, and a 10-year lease has been signed by the James Hutton Institute and IGS. Vertical farming, which refers to the practice of producing food in vertically stacked layers by using controlled environments, is set to grow rapidly as LEDs fall in cost and efficiencies increase. IGS predicts costs will fall quickly to allow crops such as strawberries and tomatoes to be added to the leafy salads and herbs currently grown indoors. Professor Colin Campbell, Chief Executive of the James Hutton Institute, said: “Vertical farming is an efficient way of growing plants on a small footprint in urban situations with low energy and water inputs. Henry Aykroyd, IGS CEO and an agri-entrepreneur with 30 years’ experience in large-scale farming in the UK, Eastern Europe and California, added: “Our mission is to enable our customers to be the lowest cost producers by growing local globally, with better quality and saving natural resources. The process uses little water, no pesticides, can enhance taste and is consistent all year round. Our real-time software can ‘grab’ power when the grid has surplus power and ‘shut down’ at peak times. Experts from IGS will be on hand at the James Hutton Institute marquee at the Royal Highland Show (Avenue Q) to discuss their vertical farming solutions. For more information visit the IGS website: www.intelligentgrowthsolutions.com.